Unifyed provides out-of-the-box integration with the most popular learning management systems, providing a seamless experience to students to access their coursework, time tables, grades and other critical information on-the-go. 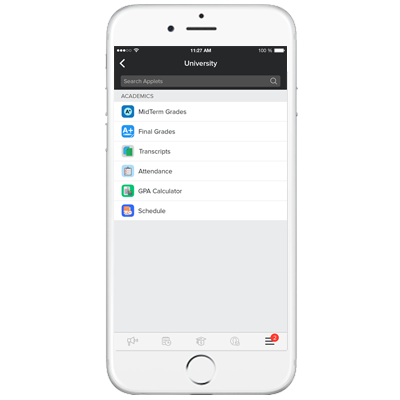 Our intuitive User Interface allows students to access their midterm and final grades with just a single click. Faculties can view class schedules, registered students for corresponding courses and send notifications through the inbuilt email feature. Students can view their academic transcripts effortlessly. Students can search from a plethora of courses providing them with crucial information on the go. Provides a simple and efficient way for students to view and mark attendance which can be verified by geofencing and/or the faculty. The app calculates student GPA for a semester, as well as for the academic year.